Sister Ann Ida Gannon, BVM, 103, died June 3, 2018, at Caritas Center, Dubuque, Iowa. Visitation will be 10:00 – 11:15 a.m. on Friday, June 8, 2018, in the Marian Hall Chapel followed by the Sharing of Memories at 11:15 a.m. Mass of Christian Burial will be at 1:15 p.m. in the Marian Hall Chapel. Burial will be in the Mt. Carmel cemetery. Sister Ann Ida was born April 2, 1915, in Chicago, to George and Hanna Murphy Gannon. She entered the BVM congregation on Sept. 8, 1932, from St. Jerome Parish, Chicago and professed first vows on March 19, 1935, and final vows on Aug. 15, 1940. Sister Ann Ida was professor at Mundelein College, Chicago, where she later served as president from 1957-1975. In Chicago, she also taught at St. Mary HS, St. Ferdinand ES, and St. Charles ES, and Our Lady of Victory in Waterloo, Iowa. Beyond her academic responsibilities, she participated in the governance processes of the Sisters of Charity of the Blessed Virgin Mary. In 1960 she was the youngest Chapter delegate participating in the election of the congregation’s leadership. Sister Ann Ida’s remarkable resume includes nine categories of personal contribution to the well-being of the world at large. Her involvement included serving on various boards related to higher education, civic committees, accrediting teams, women’s programs, and lectures to countless groups and interfaith communities. Recognition came to her through various awards including University of Notre Dame’s Laetare Medal and Who’s Who in America. Throughout her career, she received 26 honorary degrees and more than 28 prestigious awards for service in education or as an outstanding woman. Sister Ann Ida was the quintessential host. Other-centered and gracious, she greeted friend and stranger alike with warmth and encouraging words. On first meeting her, one would never guess she had a lifetime of “firsts.” Upon accepting the Laetare Medal at the University of Notre Dame in 1985, the first Catholic sister to receive it, she accepted it “for the many women religious in America whose zeal and talents are serving the Church and Society….” The world of higher education has lost a giant! She was preceded in death by her parents; sisters Margaret Mary Flau, Aileen Gannon, and Elizabeth Harrell; and a brother John. 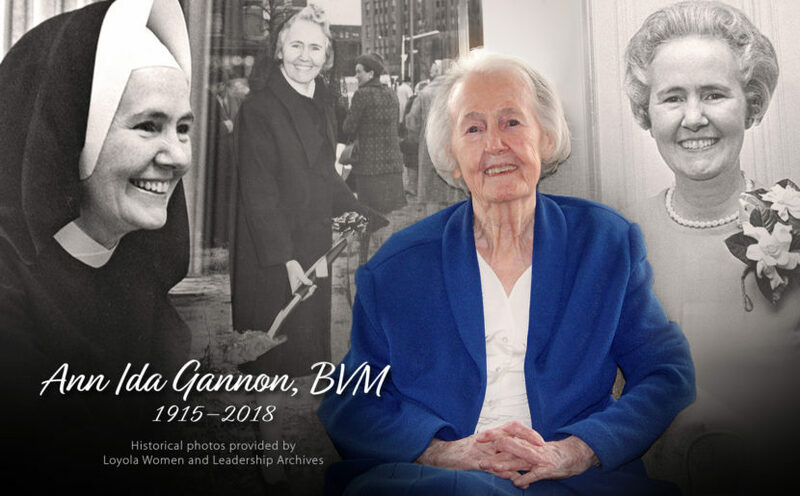 She is survived by a sister Joan Gannon, OSB of Chicago; nieces and nephews; and the Sisters of Charity, BVM, with whom she shared life for 85 years. Memorials may be given to Sisters of Charity, BVM Support Fund, 1100 Carmel Drive, Dubuque, IA 52003 or www.bvmsisters.org.